Healing Knots Blog: Friend, Dog, and Good Grief! I have a friend named Angela. We have lived around the corner from each other for over 20 years. That seems impossible because that makes us old...but, the story began when we were both pregnant with our now 20 year old children. She and her husband have been amazing friends to us over the years. We have a lot in common, and we have a lot about us that is very different. I am from Alabama, she is from New York. I have 3 kids, she has 3 kids. She has the same husband that she married in her 20's and I have the same husband that I married back in 1989. We have lived in the same neighborhood for over 20 years. Both of us lost our mothers way too soon in our lives. Both of us are "pack and go" kind of girls. We coined this phrase when each of us needed to get out of town for one reason or another. The phone call goes like this: “Can you leave tomorrow? With or without kids? Okay, I will pick you up at 10:00 AM. I will pack the cooler.” We have been known to: grab kids, jump in the car, get to the lake for dinner on a Sunday night and manage to drop the girls at school Monday morning by 8 AM-that is all it takes. Angela owns a Singer sewing machine. She is a great seamstress. I, on the other hand, am horrible, untrained sewing disaster, but I do come up with some crazy good ideas. I will call her, “Is the Singer out?” She will pull it out and we take over the dining room table with all matter of bizarre sewing adventures. She sits there and has to hold her breath as I struggle to complete my very sub-par creations. But, she does it nonetheless. Angela had a black dog, I have a black dog. That is how this story starts...Her dog Max was a standard poodle. He just left the planet for Doggy Heaven late last year. Max was a funny dog. He was truly the size of a small horse. For years, he could be spotted galloping down many streets in our neighborhood. His great escapes kept many of us in our mini-vans searching for his frolicking black fur. You could stop your car, open the door and say, "MAX!" in that cranky mother way, and he would hop in the front seat and sit taller than the driver, just waiting to be deposited back into his backyard. Max stopped his great escapes a few years ago. But, he was still a happy boy with an eager, welcoming sniff every time you came over. He was always so patient with all of the children over the years and even welcomed my 10 lb. purse dog into his home. Max's health failed slowly. His last few days were spent on the back porch; everything was starting to not work. Angela watched her sweet dog start to disappear. One day, I got the call… "Max is gone." Now, Angela is from New York and her emotions are very tidy and controlled. I am from Alabama and we let it all hang out. So I knew her simple statement was delivered in a way that sounded very matter of fact, but her heart ached; a piece of her landscape had changed. I will tell you, Angela is the kind of friend that will quietly do anything for you, any day, any time for any reason. In my early months of grief, I would call around 5:30 on Friday or Saturday night and say, "Bob is cooking. Can you and Al come for dinner?" The two of them showed up again and again. They ate whatever was put on the table, but most of all, they accepted and embraced anything that happened while we were around the table. Those early months of grief are not always enjoyable to be around. The two of them came every time and loved us through this horrible, sad time. It amazes me to this day that they even answered my phone calls. All of that being said, when Max was gone, I said, "Angela, you need a bracelet for Max. How old was he?” He was 91 in dog years...and I got to work. Her bracelet has 91 beads. They are black like his curly poodle coat. There are 5 beads that are a warm color of brown. Those are for the 5 people in his family that will miss his frisky personality and horse-like nature. Every time I see Angela she is wearing her "Max Memorial Bracelet". It is an amazing tribute to how much she loved that dog. It is an amazing tribute to what an amazing friend she has been to me and my family. I made her a bracelet to hold her heart when it ached. She showed up day after day to be with me when my heart was broken. I will never be able to repay her for her amazing gift of her friendship. 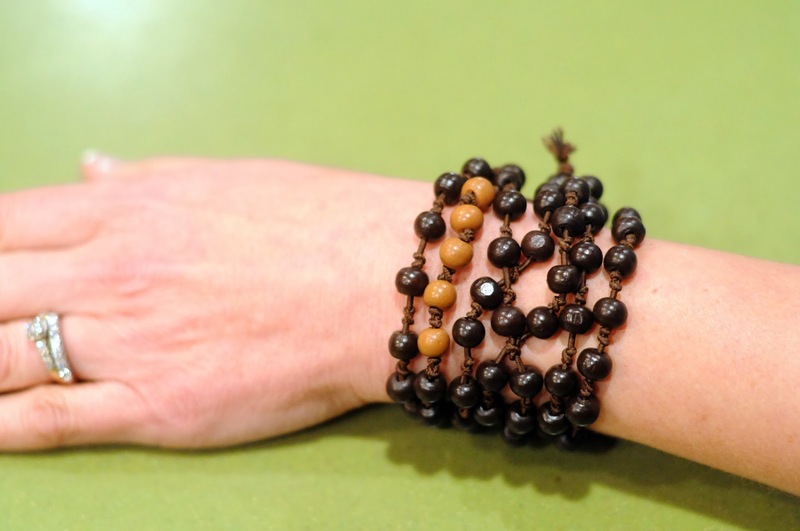 If you see a woman wearing this bracelet in Austin, stop and introduce yourself. You will have a hard time finding another person as loyal, loving and kind. Here is to Max!!! I know you are galloping in Heaven. We miss you!